Fleur’s belts are gorgeous, as expected, but they are a little high on waist for me. So I have to be more cerative to wear them ;-). I’m also wearing Shiny Things’ group gift Plainers. I love the iridescent color. My skin is new from Chai (*squeeeee*), Morpho. As for jewelry, I have the Ambrosia necklace from Earthtones (beautiful texture) and the Oh earrings from Junk. A breezy look for Summer school, which I’ll be starting in July and which was inspired by these adorable boots by Pixel Mode. I had to find some way to wear them even though it was Summer. The bag is the Letterman Bag from Republik, great texturing. Bangle is Gold Bright Sprinkle Donut Bangle Set from Fresh Baked Goods. We’re all thrilled Viva La Glam is back. The new summer line is up to their normal standards. My jumpsuit and bracelet are both part of the new line. The bracelet actually color-changes between silver and gold. My skin is one of the Fleur Dig Ophelias, the last of the Vivant line. *pout* Only the fact the each of Fleur’s new lines is better than the last keeps me from whining at Roslin and CJ. 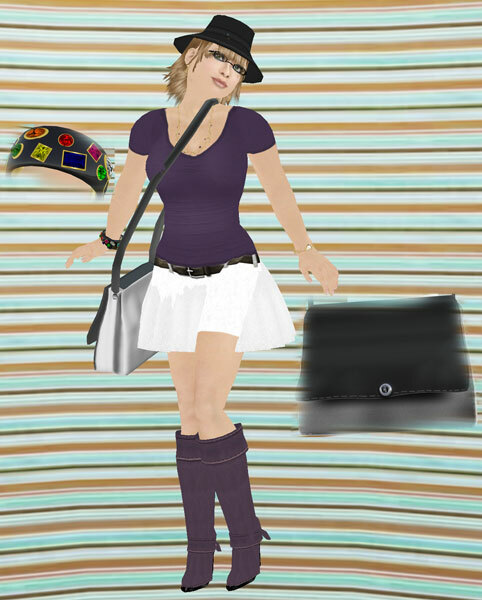 You are currently viewing the archives for June, 2008 at SL Fashion Notes.